Hello. My name is Karen and I’m a Collectoholic. It all started when I was a child, collecting stamps and the labels off wine bottles and anything else that caught my eye. But in recent years it’s progressed to a more serious condition and I’m currently supporting 14 collections of ‘stuff’. I mostly collect stuff from the early to mid 20th century but that’s not a definite boundary. I thought it might be cathartic to write about some of my collections in this blog. Of course there’s a danger that this might have the reverse effect and encourage me to start even more collections, but that’s a risk I’ll have to take. So first cab off the rank is Teapots. I inherited a collection of novelty teapots from my mother (see it’s her fault, not mine). I’ll talk about those in a later post. 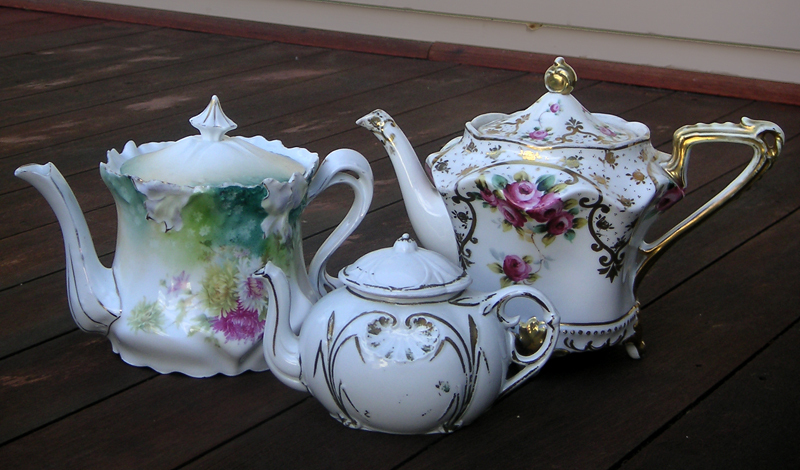 But as a subset I have a small collection of Victorian and Edwardian porcelain teapots, three of which are pictured below. I really love these old ones. There is such an air of elegance about them. Most teapots from this era came with a matching teapot stand, but typically this is one of the first things that get damaged so many teapots don’t have the stand. I don’t have a lot of information about them and the makers’ marks are not helpful. I’m particularly curious about the one with the red roses and gorgeous gilt work. It has a mark of crossed anchors (not crossed swords) on the bottom and I’m advised that it’s of European manufacture (late 19thC). But this mark does not appear on any list of porcelain markings that I’ve seen. If anyone knows anything about a crossed anchor mark I’d really appreciate you getting in touch with me. The tiny one is probably the oldest of the three and the gilt has rubbed off in a number of places. And the greenish coloured teapot is probably Edwardian, around 1910-20. I’d be interested in hearing what you find out about them. I have a set of china which I am looking for replacements but can’t find the maker’s mark online either. Tink, I have a 1930s dinner set made by Burleigh which doesn’t have a name. I found its catalog number at Replacements.com and they advise me on any pieces in my pattern that they come across. Perhaps it may be of help to you. Thanks for coming over to my blog. I love the teapots! I have a collection of cups and saucers (english bone china only, please) that is overflowing my curio cabinet. Both my grandmothers got me collecting those. Roses are my favorite. I think your teapots are gorgeous…it makes me think of how lovely a cup of nice tea is. Oh My, this looks like the twelve step program I need. Hi, my name is Rae and I AM a ceramicaholic. It’s ridiculous. I have limited my collecting to American made pieces, so that helps a little! I have teapots, dinnerware, white ware & more. I might be able to help some with questions, as I have acquired quite a bit of useless pottery information over the years. Oh, I almost forgot, can I see a picture of the mystery mark & the mystery pattern? Thanks Rae. I’m sending you a pic of the mark and if you can identify it I will be very grateful. Nope, it’s not working for me either. With all due respect… but don’t you think you might need to get a little help? My brother’s room is totally and fully stuffed with …ehm old stuff and he just doesn’t throw it away. Hm… I hope the story helped a little… I’m just very concerned about collectors…. Well I’m not entirely sure where you’re coming from Mo. You seem to be offering me rehabilitation advice,but that assumes I actually want to be rehabilitated. I’m actually quite happy to be a collectaholic but I’ll definitely keep your words in mind if I find it taking over my life. we have some china bearing the crossed anchors mark which you describe. We have five cups, six saucers, milk jug, sugar bowl, 1 large plate and about 18 side plates. These were bought for us as a present and ever since we have been trying to find out something about them without success. Yours is the first reference to this mark which we have found. I have some photos of the items which I could e-mail to you if you would be interested to see them. btw: oh my I just read my piece… ?! That’s what most important isn’t it?? It has a raised pattern of scrolls and flowers around the body, and a simpler pattern on the foot. All the raised patterns are gilt, as is the body of all the flower heads. This has the crossed anchors on the base in green. I have no history, and would like to know more. I too have some pieces with the crossed anchor marks so would be very helpful with replies as I have tried to find some information about them, but so far I have been unsuccessful. They are of the same design as the teapot, ( Blue gilt with roses ) in the picture that was earlier posted. It’s very exciting to hear that someone else has porcelain with this mark. Do you have any photos? I would love to see them if you do. I have a set of china with crossed green swords and am trying to find out anything I can about them, they were given to me by a lady who’s mother had given it to her so I presume they are quite old. Any help would be greatly appreciated. are green crossed anchors can you tell me anything about them. The pieces were given to my Mum by her sister in Ireland years and years ago. I’d love to be able to tell you more about your crossed green anchors but I’m still searching for information myself. A few people have commented here that they have porcelain with this mark on it so I’m hopeful that someone will be able to give me more info some day. Stay tuned. I’m also a collector of many old stuff, but I find a cure, when you move sell it and just start new at your new place, then you have all the excitment all over. Good theory Jakes but it would never work for me. I love my collections too much to get rid of them. I also have a teaset with these crossed green anchor marks. Has anyone found out any more abou them? Mine were from my grandmother who was Irish and she married in the early 1900s so I suspect they could have been new then. Would really like to hear of any information.